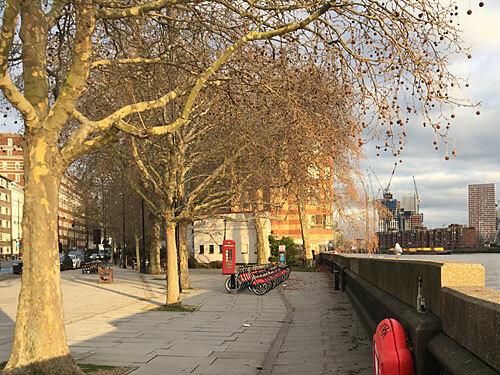 Although central London is well blessed with Thames crossings, a gap of over a mile exists between Vauxhall Bridge and Chelsea Bridge. 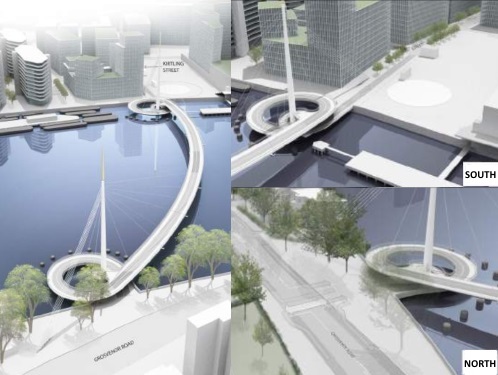 To help fill the hole a new bridge for pedestrians and cyclists is planned to be built between Nine Elms and Pimlico, unexcitingly called the Nine Elms Pimlico Bridge. Wandsworth council and local developers on the south bank are keen, so are stumping up expertise and cash, whereas Westminster council and residents on the north bank prefer to tut occasionally and see what happens. It's been a long time coming. An initial feasibility study was carried out in 2013 and a winning design announced in 2015. Precise location proved controversial, so in 2017 to break the impasse nine options were proposed (numbered 1-9 on the map above). Last year these were narrowed down to just three (that's 4, 7 and 8), and last week option 4 was declared the winner. It still has to be ratified at a Wandsworth council committee meeting tomorrow evening, and only then can a proper design be undertaken and planning permission sought, so we're still at least five years off it ever being opened. But the NEPB would be a nice-to-have, and might even beat other Thames crossings in East London to completion. Here's where the northern end would land. This is the riverbank alongside Grosvenor Road, just to the west of Claverton Street. It's the last open section before a residential stretch, complete with benches, cycle hire docking station and a proper red telephone box. It's currently possible to park here, which may no longer be the case if the bridge is built. It boasts some splendid plane tress, which should be OK because the proposed design has a minimal onshore footprint, spiralling out around a mast in the river. And it's precisely halfway between Vauxhall and Chelsea Bridges, which geographically is as good as it gets. The two unchosen options each landed further east. One would have launched off from Pimlico Gardens, a historic patch of greenspace opposite St George's Square, and the other would have taken out two private tennis courts used by residents of monolithic Dolphin Square. These are prime well-heeled neighbourhoods, whose collective population was less than thrilled at hoi polloi cyclists and pedestrians being funnelled through their riverside backwater. At the selected location the adjacent land is covered by the postwar Churchill Gardens estate, originally social housing, so relatively less likely to complain. Unusually the bridge will cross the Thames obliquely rather than heading directly across. The shortest route would have landed amid the Riverlight development, three of the first towers of 21st century flats to erupt along the Nine Elms shore. It wouldn't do to interrupt the bars and restaurants already trading, with their sourdough pizza specials and eight quid octopus starters. Instead the bridge will curve upstream in a gentle arc to land somewhere that isn't housing yet, which is damned clever because nobody who's ultimately going to move in yet knows to object. It's not presently possible to visit the point where the bridge will touch down on the southern bank. That's because this wedge of ex-industrial riverside is under occupation by the Thames Tideway project and their squadrons building a sewage tunnel beneath the river. From Kirtling Street little can be seen of the vast white shed by the foreshore, only a broad overhead conveyor belt transferring spoil from the 60m deep shaft onto waiting barges. Engineers expect to be on site until 2022, only after which can bridge construction potentially begin. This worksite is also due to become Phase 7 of the Battersea Power Station development, the final enclave of upscale flats, and at time of writing Phase 3 is only just getting off the ground. 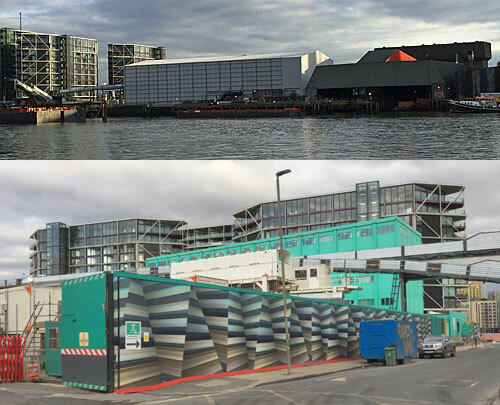 Meanwhile Phase 6 nextdoor is currently Cringle Dock Waste Transfer Station, an unsightly terminal used to despatch municipal waste from four inner London boroughs downstream to the incinerator in Bexley. It stinks, which didn't used to be a problem when this was the derelict back of beyond, but isn't ideal amid a luxury development. So important is this facility that's it's scheduled to be rebuilt and modernised, then enclosed inside an eco-box before being surrounded by a horseshoe of lofty flats. Future residents will have to put up with living somewhere rubbish, and I'm not sure being perfectly positioned to use the new bridge will tip the balance. It is however this proximity to Battersea Power Station that's getting the footbridge project funded. They want maximum accessibility, which is why they've paid millions to hijack the Northern line and have opened a Thames Clipper pier outside (as yet very quiet). Better cycling connections can only boost long-term apartment sales, and who knows, the independent-minded citizens of Pimlico might one day appreciate a link to some new local shops.